There are over 40 superhero movies coming up from Marvel and DC, so what does director Christopher Nolan think about it? Christopher Jonathan James Nolan is a British film director, screenwriter, and producer who directed and co-wrote the wildly successful Batman movies Batman Begins (2005), The Dark Knight (2008) and The Dark Knight Rises (2012). Warner Bros made over one billion dollars off his Batman movies and pursued him to produce a Justice League and Batman reboot, but he turned them down. He produced Man of Steel, but that's it. While talking to Time Out about his upcoming sci-fi movie Interstellar he talked about the upcoming DC superhero movies. "You don't want Hollywood to hit saturation point with those things. But then Zack Snyder is now doing his part by bringing Batman and Superman into one film [for 2016's Batman vs. Superman: Dawn of Justice], so that limits the number! "But yes DC Comics have just announced an enormous number of movies. Well, you know, as long as that's the ride people want, the studios will continue to offer it. I don't see it as a limited genre. If I did, I never would have worked for almost ten years in that genre. I think like any genre, like the Western, it has limitless opportunities. It's just about the audience's appetite. What's very important is that the studios be open to making other sorts of films at the same time." When asked if he would make another superhero movie he said "it was a good decade of my life and I find it hard to imagine returning to it. But never say never." Are there too many superhero movies coming? 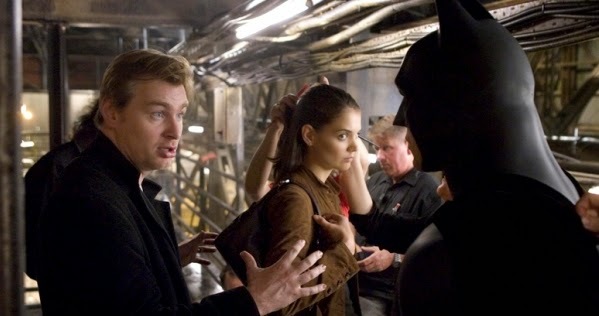 Would you like Nolan to take on another superhero movie? Why or why not? If so, what superhero should he take on? What was your favorite part of the "Dark Knight Trilogy"? Too many? Heck no! But I can understand why Nolan wants to move on to other things. I'm enjoying all of the superhero films, although I've never been a superhero comics fan. They can keep making them until people no longer want to see them. As long as they remain as varied (and as good) as 2014 produced, I don't think there will be a problem. For a while. I do worry about over saturation. I love a good superhero film, but when they start being just films to make a buck, I start to lose interest. Plus, I worry they'll find some of my favorite characters and completely butcher them, and well, that'll just be no fun. I think by 2020 they will definitely have hit saturation point. It's this problem that thanks to Marvel every studio wants their own "cinematic universe" plus now they're expanding onto the small screen/Netflix, so eventually you have to think people are going to get tired of that. But I've thought that about Survivor and American Idol and they're still going strong almost 15 years later! Obviously the superhero movie Nolan needs to do next is the Scarlet Knight. Will WONDER WOMAN Trilogy Be Set in the Past?